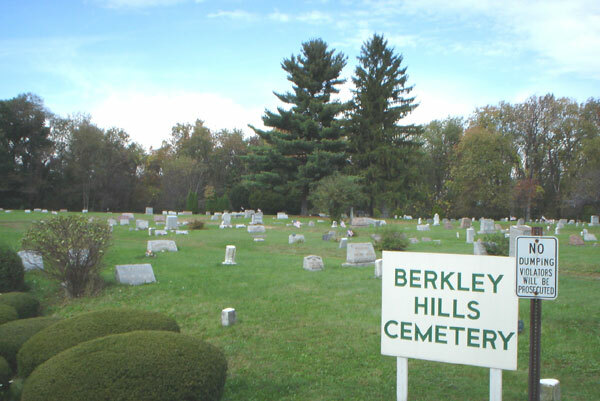 This cemetery was photographed in 2016 and is currently in the process of being updated. Photo contributed by Brian Cartwright. Note: This information has not been provided by any official cemetery source. It is offered here as a tool to promote further research and should NOT be considered as verified proof for genealogical records. ALMOND, Arvel E. 1871 1952 h/o Helena M.
BEABES, Blair A. 1878 1953 h/o Emma S.
BEAM, Desmond B. 1919 1973 h/o1 Elizabeth Green; h/o2 Mildred L.? BEAM, Hazel M. 1897 1959 w/o John M.
BEAM, John Calvin 1869 1951 h/o 1) Caroline (Mishler), 2) Stella R.
BEAM, John M. 1896 1943 h/o Hazel M.
BERKLEY, Donald R. 1910 h/o Marion K.
BERKLEY, Irvin J. 2 May 1883 25 Jun 1953 h/o Stella M.
BERKLEY, Marion K. 1915 1973 w/o Donald R.
BLAUGH, Lillian M. 1909 1991 w/o Robert E.
BLAUGH, Robert E. 1906 1953 h/o Lillian M.
BOLLERHEY, H. Morton 1888 1973 w/o Belle V.
BOLLERHEY, Henry 27 Apr 1860 9 Apr 1915 h/o Sarah E.
BOYER, Henry M. 1881 1930 h/o Elzie V.
BOYER, John W. 1883 1956 h/o Iva P.
BOYER, Richard G. 17 Mar 1928 30 Oct 1965 h/o Evelyn G.
BOYER, Thomas E. 1889 1982 h/o Annie E.
CARLSON, Thomas L., Sr. 1899 1974 h/o Mary M.
CHAPPLE, Charles E. 1866 1943 h/o Lulu E.
CHASE, John E. 1878 1938 h/o Marguerite B.
CHILCOTE, Winnie 22 Oct 1890 17 Apr 1960 w/o Charles P.
CONFER, Benjamin L. 1901 1968 h/o Clara e.
CUNNINGHAM, Merril R. 1898 1931 h/o Carrie B.
DAVINSON, George 1891 1964 h/o Leeta F.
DOM, Henry T. 1857 24 Oct 1941 h/o Bettie C.
EMEIGH, Charles F. 1889 1967 h/o Bertha B.
EMEIGH, Daniel N. 1885 1963 h/o Mary I.
FAUST, Irvin N. 1887 1960 h/o Gussie E.
FESKO, Michael 1896 1965 h/o Ethel C.
FLOWER, Frank J. 1875 1941 h/o Catherine F.
FOUST, Merle A. 1910 1974 h/o Florence E.
FOUST, Robert N. 1869 1951 h/o Eliza J.
FRITZ, Edward G. 19 Aug 1863 21 Mar 1933 h/o Minnie M.
GARDNER, John A. 1886 1960 h/o Mae E.
GARMAN, Howard W. 1876 1959 h/o Mary E.
GINDLESPERGER, Lloyd E. 1898 1969 h/o1 Gertrude M. Henze; h/o2 Rose M.
GRUBB, Harvey 1882 1959 h/o Frances R.
HOWARD, David J. 1866 1956 h/o Florence E.
INSCHO, John S. Sr. 1871 1949 h/o Mary K.
JONES, Francis P. 1906 1990 h/o Mabel E.
JONES, Philip E. 1885 1951 h/o Celia V.
KEAFER, William 1877 1961 h/o1 Annie Berkey; h/o2 Lulu G.
KELLEY, John H. 1892 1969 h/o Sarah J.
KELLY, Harry M. 1877 1967 h/o Ida M.
KELLY, Irvin H. 1880 1959 h/o Rebecca R.
KELLY, J. Forest 17 Nov 1906 16 Oct 1987 h/o Jennie E.
KELLY, Mary (Miller) 1850 1929 w/o John W. Kelly, Sr.
KEMERER, Henry D. 1883 1963 h/o Ethel F.
KIMMEL, Oliver B. 1879 1958 h/o Goldie V.
KRUG, William A. 1879 1957 h/o Verda C.
KYLER, Robert C. 1892 1943 h/o Rose G.
LEHMAN, Percy W. 1890 1967 h/o Elsie A.
LIVINGSTON, Edmund M. 1867 1933 h/o Minnie J.
LIVINGSTON, Leonard 17 Nov 1908 7 Dec 1969 h/o Charlotte V.
MacEWAN, John 1870 1953 h/o Mary H.
MARDIS, John E. 1913 1964 h/o Luella M.
McCLINTOCK, Arthur S. 1907 1990 h/o Annie R.
McGRAW, Edward T. 1877 1963 h/o Anna E.